Lieutenant Armstrong is an officer with U.S. Army Intelligence. His rank is used where a first name would normally be used because we never learn his first name. He certainly has one (the Army requires it) but we are never told what it is. We only known he is a lieutenant in the American Armed Services. We also know from his depictions that he is male, Caucasian, and somewhere in his late twenties. He has short (required) hair, brown in color. He is good looking and in quite good shape in the "lean and mean" variety. There is not much more that is told to us largely because he is not around very long but a couple of things can be inferred. Since this short series takes place just before the Americans got into World War II and historically advancement was not particularly fast then, he likely has been in action for half a decade. He is quite brash and impulsive despite his likely experience because he dives into danger (literally as well as figuratively) with nary a hesitation (or much thought) and he runs afoul of the bad guys as a result. He is resourceful and self-sufficient because he gets himself out of his problems, usually by himself. He is not oblivious to his impetuosity because he on a couple of occasions has to admit to himself that he got "lucky" to have survived something he did on the spur of the moment. We also know that he is thought well of because he always works alone and his field of operations is quite wide. Officers not trusted or respected get desked and a desk is not something Armstrong bothers with. 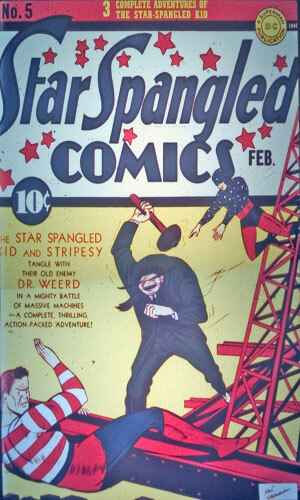 D.C. Comics brought out its new Star-Spangled Comics in the fall of 1941, starring the brash, young, eager superhero, the Star Spangled Kid". This young man with the adult sidekick (nice twist to the norm) was introduced a month earlier in Action Comics, a Superman platform, because the Kid was created by Jerry Siegel (co-creator of Superman). 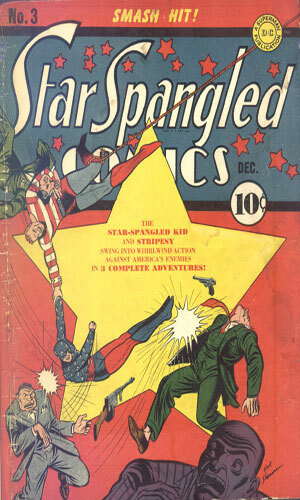 In the first issue of Star Spangled Comics, in addition to two stories about the Kid and his pal, the world was introduced to four other individuals: Captain X, Tarantula, Lefty Banks, and Armstrong of the Army. None of these caught on or lasted very long. Armstrong had 8 pages of action in each of the 6 stories we were given. Then he disappeared. Note: the titles of the adventures, enclosed in quotes, are mine. 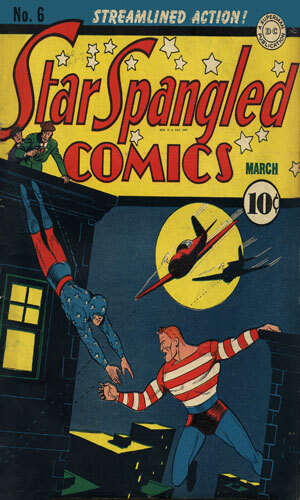 From Star Spangled Comics #1 - Arriving at the army's new desert air base, Armstrong sees overhead a plane being attacked by another and shot down. The doomed plane had film showing the layout of the base and enemy agents go after it. 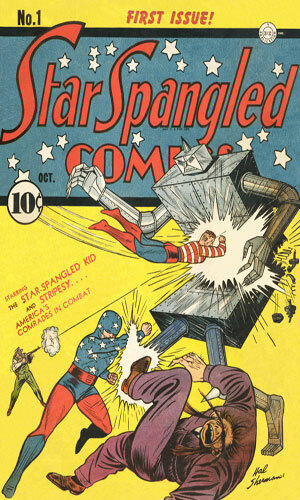 From Star Spangled Comics #2 - Armstrong is assigned to protect a scientist with a "time ray" which ages anything it touches. Naturally others want it. From Star Spangled Comics #3 - A Colonel Faltz tells Armstrong that a Captain Fanning is a spy and wants to lay a trap to prove it. Armstrong suspects the colonel of being the rat. 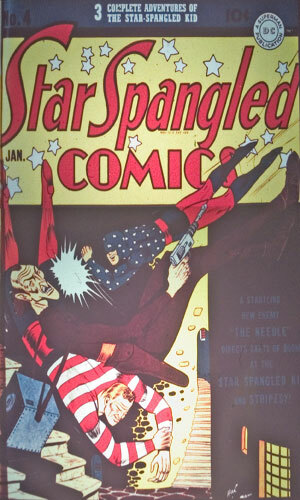 From Star Spangled Comics #4 - 9 Army planes have crashed, sabotaged by sand and the pilots missing. Armstrong is send to investigate. 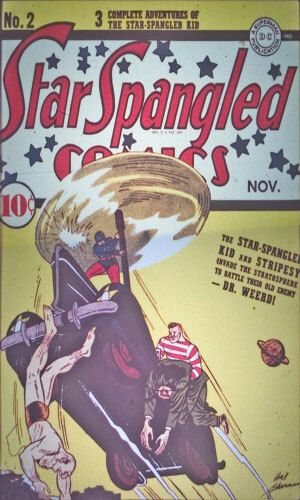 From Star Spangled Comics #5 - Vacationing in Florida, Armstrong is doing some deep sea fishing when an enemy sub mistakes his charter boat for another and surfaces for a meet. Armstrong wants to capture the vessel illegally in American waters. From Star Spangled Comics #6 - A call from an Army captain in a new base in the tropical country of Costa Blanca tells of a string of killings by jungle cats which looks like planned attacks. Armstrong heads there to solve the case. There is not enough of Armstrong to decide whether to like or dislike the character but since he was only around for six issues/adventures, it is fair to say that someone at the publisher did not have any reason to keep him around. The creator, Ed Moore, according to the short bio I found on him, worked in the comic business for a couple of decades. Armstrong came along halfway through that period showing me that Moore knew what he was doing. He just created a plain vanilla character in a comic world where that did not get you noticed or asked to stay.